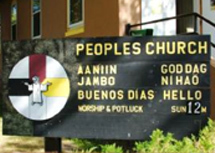 Peoples Church is a multicultural mission congregation of the Evangelical Lutheran Church, with a special emphasis on outreach to people living in poverty. Ten years ago Pastor Bob Kelly and Carol Kelly--moved by the spiritual and medical needs of the poor and homeless in the Bemidji, Minnesota area--started the ministry. Meet The PeopleFind out more about Pastor Bob Kelly and other people at Peoples Church. We have a rich history, and a vibrant team of people who make a difference in Bemidji and beyond. Sunday Noon Feast, followed by 1 pm Worship Service.